i'm not from texas but my grandparents were. we were raised hearing that everything is better in texas. this cake is proof of that. it is so decadent and, oh, so good. it's a crowd pleaser and there is definitely enough cake to share...though i'm telling you right now, you won't want to. preheat oven to 400 degrees. mix flour and sugar in a large bowl and set aside. in a saucepan, heat the butter, cocoa and water until boiling. pour the boiled mixture over the flour and sugar mixture and mix well. add the eggs, buttermilk, baking soda, cinnamon and vanilla. mix well. 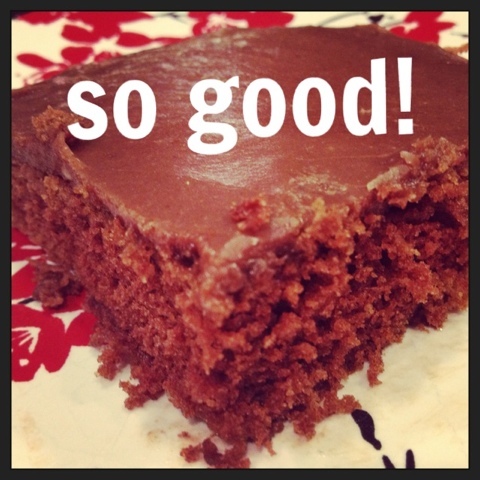 pour the ingredients into a greased sheet cake pan. bake for 20-25 minutes. heat the butter, cocoa and milk in a saucepan until well blended. add the powdered sugar to the melted mixture until smooth and creamy. when the cake is removed from the oven, pour the icing mixture over the cake while the cake is still hot. top with the nuts. cool, slice and serve. amazing.